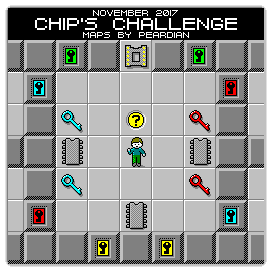 For this month's "Maps Of The Month" featurette, I wish to draw your attention to Peardian's Chip's Challenge (PC) maps. The nerdy Chip McCallahan wants to gain membership into the exclusive Bit Buster Club, led by Melinda The Mental Marvel. To do so, he must pass through 149 levels of Melinda's "Clubhouse", full of hazards, creatures and puzzlish scenarios. Do you have the brains to help Chip survive this virtual nightmare and take Melinda to the E-Prom? Mario game mapper Peardian actually gives us maps for a non-Mario game (and last month featured a Mario game not mapped by Peardian)! There may have been a number of top-down view puzzle games on the PC at the time, but Chip's Challenge had some renown. It was originally developed for the Atari Lynx, and despite (or maybe because of) the Lynx's unpopularity, it was ported to a few other platforms. It found some popularity on Windows 3.1 by being featured on Microsoft Entertainment Pack 4 and Best Of Microsoft Entertainment Pack. But it would take 26 years for a sequel, also made by the original creator, Chuck Sommerville. What makes Chip's Challenge particularly challenging is its limited view. Peardian's maps show you each whole level, giving Chip a better chance to clear these challenges and meet up with Melinda. Thanks, Peardian! So for mapping a real Windows classic (that's not Solitaire or Minesweeper), Peardian's Chip's Challenge (PC) maps will be known as VGMaps.com's Maps Of The Month for November 2017. Peardian, I like this guy. His maps are fantastic, and how surprising that he goes and maps this game. I have played this game last summer. I didn't like it to be honest (The level design is kind of wonky to me), but I understand the idea of it and how it gave inspiration to many puzzle games to come. For example, a game called Wonderland which I have just fully re-mapped. You can see the reminiscence of that game to Chip's Challenge. I recall Peardian saying somewhere or somewhen about the nostalgia behind this game being the reason for it being mapped. Not every game featured for the Maps Of The Month have to be the best-looking game ever made. And in my research it seems this game did have a fair following, it isn't just Peardian who likes it. This, certainly, is the map of the month. I have played this game last summer. I didn't like it to be honest (The level design is kind of wonky to me), but I understand the idea of it and how it gave inspiration to many puzzle games to come.sizegenetics For example, a game called Wonderland which I have just fully re-mapped. You can see the reminiscence of that game to Chip's Challenge.